Do you want financial freedom and to live life on your terms? Do you want to learn the truth about passive income and how you can have recurring cash flow month after month with minimal effort? Are you tired of being lied to by all these supposed financial "gurus" who claim they make $10,000 per month - but in reality only make a fraction of what they disclose in actual net profit? The fact is that there is a lot of misinformation, scams, and myths out there when it comes to passive income. I go straight to the point, without fluff or sugarcoating the facts. I give you the cold, hard truth! I got tired of hearing all these "experts" spewing their outright lies on the Internet and deceiving people, so I decided to make my own audiobook that gives you actionable information to change your life's financial situation. Maybe you want another side hustle but just don't know where to start. In my audiobook, I go into in-depth details of the various business models that exist that you can tap into to achieve your financial goals. You will gain insights to the benefits and risks of each wealth-creation vehicle and be able to make better-informed decisions. Remember, in business there are always risks, but I teach you how to take measured risks and mitigate any potential pitfalls. If you're tired of not having enough money, living paycheck to paycheck, or just want to better your financial understanding of business, my audiobook will walk you through everything you will need to know before starting. If you're tired of working your nine-to-five job and want to take control of your financial situation, design your ultimate lifestyle, and take back your freedom, I strongly recommend you take action now and equip yourself with the knowledge necessary to prosper. Life is too short to live with financial regret! Change your life today and make the greatest investment in yourself. ©2018 Healthy Pragmatic Solutions Inc. (P)2018 Healthy Pragmatic Solutions Inc. This is the dream. However this book straightens out the misconceptions and gives acutall practical ideas. But this is not a get rich quick guide. Real work has to be dne after this book. For someone like me who has zero experience in all this passive e income stuffs, this sure has helped me a lot. To say that it’s an outstanding guide to date would be an understatement. I’ve just learned proven ways to boost my income on the side! I was playing with the idea of real estate rentals and your discussion puts it in sensible outlook for me. This sure is a great read! After spending hours listening to this book, I can say it has the best recommendations. It’s neither weak nor boring. One of the sections I find really useful is the discussion on the trading platforms. I agree with the author. It’s something I find profitable when you really work on, so I’m gonna focus on that. My friend suggested me this book. I listen to it and it was very much helpful. It describes some tips on how to earn money online. As I was a beginner it helped me a lot. So I recommend it to everyone who wants to earn money online. 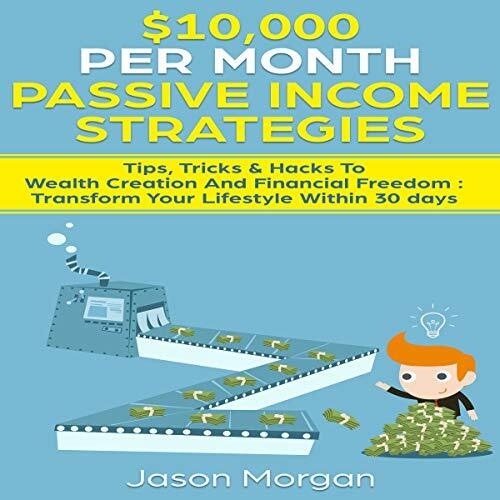 There are a lot of ways to earn passive income and this book had mention most of the common online businesses or ways to have passive income and to have a good future ahead of us. Simple effective n smart .this book is a perfect library companion for anyone tired of working for others. Very interesting and informative. I will use his advice to advance my online business. This book is what I need to learn how to earn passive income! It has all the information and guidelines I need to know. I personally think that the book is very informative for beginners like me. I was skeptical with the book’s title but it piqued my curiosity. I’m welcoming the methods and strategies endorsed by the writer of this book. They sound logical and quite easy. Following them is almost no sweat at all! There are tons of passive income books in the market, but only one caught my attention. And this is it. I’m already tired of going to work 9 hours a day and living up to my budget. I believe it’s time to reward myself and I just got the right book to start with. The section on how to repair bad credit score is highly appreciated! I’ve been meaning to fix my credit score and the tips here are attainable. And I’m already familiar with some of the ideas on passive income streams, but it’s still good to be reminded of them. Greatly informative for those wanting financial freedom. Lots of the examples in the book the author has actually done himself. I highly recommend this book to all the people who want to learn how to have passive income. It gave step by step discussion on how to start and on how to earn good money. As a young entrepreneur, It is very interesting and helpful in my future business ventures. A lot of opportunities in a lot of different areas. Some I found very interesting and informative others not so much. The author tries to provide as many different ways as possible to help get you motivated to work online. I choose what is perfect to me only. So I am able to do the work better. I really suggested this book to all my friends who want to make money online. it is the best. This book providing important tips for passive income. Appreciating content. Great informative book. Learning stuff.